Nourishes and protects wood whilst enhancing the grain. Contains UV inhibitors to prevent fading. Use Rustins Decking Cleaner 45326 prior to treatment when decking is in poor condition. Approx coverage 14m2 per litre. Hazard safety codes:R10, R43, R53, R65/66. 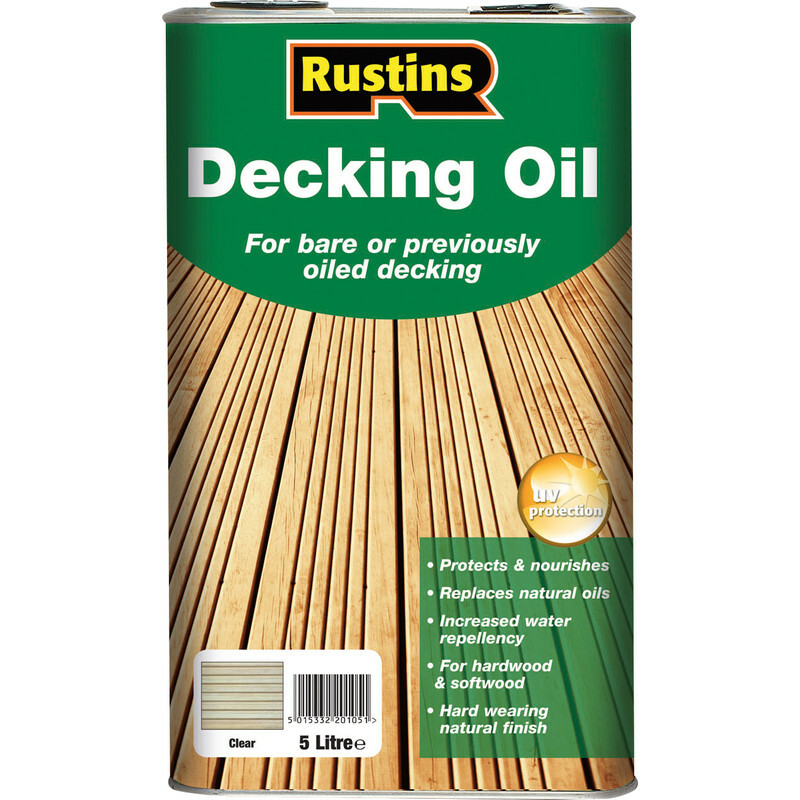 Rustins Decking Oil Clear 5L is rated 4.3 out of 5 by 15. Rated 5 out of 5 by Roy60 from Good product Great gloss finish. Bit darker than I wanted but looks good. Rated 5 out of 5 by Hambo from In my view - the best for permanence. I have used Rustins for several years and, although it can be difficult to find available, I find it is the best for penetrating the deck timbers and providing a really permanent finish. In my view it beats water based emulsions every time. Rated 3 out of 5 by none required from General Builder Bought this to seal 30 sq /m of jetwashed decking. Leaves a good colour and applies easily however it doesn't cover anywhere the number of square meters it says it will even on a second coat. Probably purchased 3.5 times move than it advised. Rated 4 out of 5 by Jilly from Brilliant decking oil Brilliant job does exactly what it says. Easy to use very pleased. Rated 4 out of 5 by Bodger b from Decking oil Soaks In quickly and dries well. Rated 5 out of 5 by Charlie17 from An unexpected result My decking is 20 years old and looked it. Followed the instructions for cleaning the deck and 5 litres if oil just made one coat. A tired, shabby looking decking has been rejuvenated and the surprise result is after one coat there is a sheen to the timber. Will give it a 2nd coat in due course. Wife very please..nuff said.